If you want to try vaping CBD for the first time, this is probably the best place to start. It’s a great product with great customer support. The biggest caveat is price, so if you are used to dosing a large amount of CBD per day, it probably isn’t the most cost effective for you. If you can afford it or don’t need to make vaping your primary CBD source, you should order these. The CBDfx CBD vape pen is so beautiful on the outside, which naturally made us very excited to give it a try. If this product works as well as it looks, we’ll have another positive review for a CBDfx product. Let’s see what we found out about it. While CBDfx offers a wide range of products now, their roots are in the vaping world. They’ve been around since 2015 and are known for being a brand that is serious about their products’ quality as well as their customer service. They are based out of Los Angeles and have an office in the UK as well. 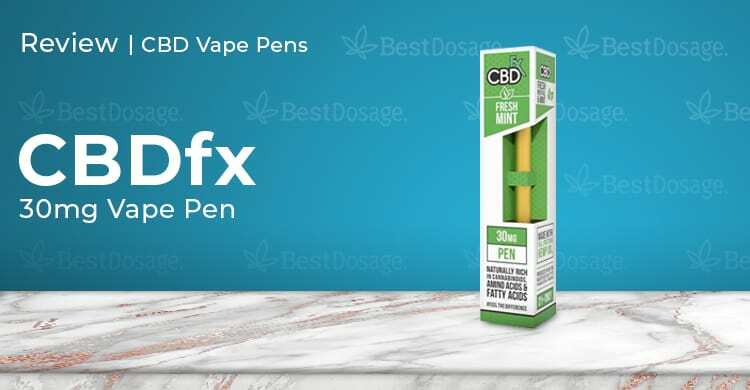 The biggest surprise about the CBDfx CBD vape pen is that they only come in two flavors, as of this writing. You have to be very confident in your product to create such a minimalist line. They sell each flavor as a stand-alone, or in packs of multiple. They do also carry a vaping kit and cartridges, and CBD vape juice if you want to create your own setup. These disposable CBD vape pens require less effort, allowing you to puff until you’re done and then simply throw them away. 12/18 Update! Perhaps CBDfx was as surprised as we were about their flavor selection, because they’ve since added two more awesome flavors. In addition to their Strawberry Lemonade and Fresh Mint flavors, you can also choose Tropic Breeze and Blue Raspberry. Enjoy! If looks are to believed, this is the Rolls Royce of CBD vape pens. They’re produced in gold colored brushed metal with the CBDfx logo near the mouthpiece. These are incredibly good looking vape pens. Seriously, we haven’t come across any pens that looked nearly this good. In terms of packaging and looks, they’re in a class of their own. The excitement didn’t end there, either. They may be based near Hollywood, but the looks weren’t just a show. Plainly put, if you’re interested in great flavor, this is probably where you want to start. As we wrote above, CBDfx only offers two different flavors of their disposable CBD oil vape pens, but they both are incredible. We’re a bit obsessed with their Strawberry Lemonade, but the Fresh Mint is equally tasty. These vape pens have a balanced airflow and create some really nice vapor, due to their e-liquid having a PG/VG base like “regular” vape pens. If you want to know more about the different types of CBD vape pens, check out our Guide to CBD Vape Pens. This will vary, but overall you should remember that the CBDfx CBD vape pen is on the lighter end of the spectrum. That means you may have to take more puffs on these compared to others. Our experience is that 3-4 puffs will get you through a few hours as newer CBD user. More veteran users will likely end up closer to 6-8 puffs per dose. You’ll have to find the right sweet spot, just remember with these specific CBD vape pens don’t be as hesitant to up your dose a little faster than normal. When we did get the number of puffs right for each of us, we felt great dosing CBD with these vape pens. It took effect quickly and marched through our various ailments (anxiety, pain, insomnia, to name a few) like they were no match at all for mighty CBD. That feeling ran out after about 2-3 hours, but again it is a very individual estimate. Be prepared to vape throughout the day with these. Proprietary blend of CBD (Cannabidiol), Propylene Glycol, and Vegetable Glycerin. Natural flavors added for taste. You can contact CBDfx via email, live chat, or phone support. They give you a one-year warranty on their products and a 30-day money back guarantee. These are hallmarks of a company that really stands behind their products, and are not a given for all CBD brands. Suffice to say, very impressive. Free shipping on all orders in the USA – can’t beat that! This CBDfx vape pen review was an absolute pleasure for us to conduct. We loved the CBDfx CBD vape pen as the perfect way to dose during the day, and you’ll probably love them too. With their 30-day money back guarantee, you don’t have much to lose.